Name: TVPM. Experience Designer Academy.Co-Creating a Prototype 8.30.18. 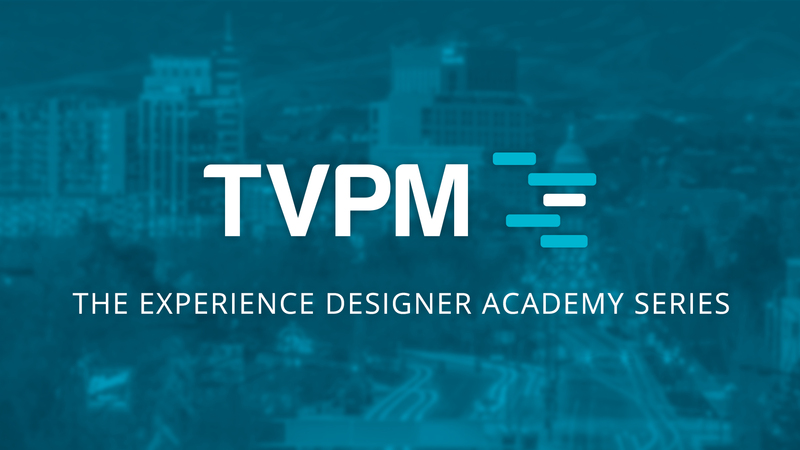 As a follow-up to the very successful Experience Designer Summit, TVPM is pleased to announce the first monthly event in a quarterly successor program called the TVPM Experience Designer Academy. The objective of this monthly follow-on series is to further build product owner and experience designing skills while creating a deeper relationships within the professional community. Snacks and soft drinks will be provided. All meetings will be held in the conference room of the ITC, which is located on the 2nd floor of the US Bank Building, 101 S Capitol Blvd in Boise. During this session, a product champion will present a concept in various states of completeness. The champion bringing the product concept would also bring experts who can validate the concept. These experts would be queried during the Ask the Experts phase. The goal is take a concept and build a prototype that could be used for market validation. On August 30th, Mr. Josh Paulson will present a product concept centered cages for and accessories for pets. Registration is free, but seating is limited to 60, so register soon! *This is session 1 of 3.